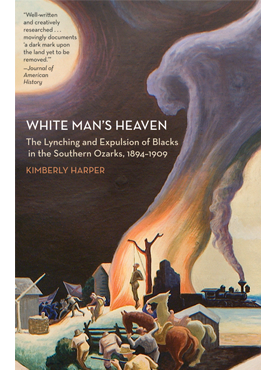 White Man’s Heaven is the first book to investigate the lynching and expulsion of African Americans in the Missouri and Arkansas Ozarks in the late nineteenth and early twentieth centuries. Kimberly Harper shows how an established tradition of extralegal violence and the rapid political, economic, and social change of the New South era combined to create an environment that resulted in interracial violence. Even though some whites tried to stop the violence and bring the lynchers to justice, many African Americans fled the Ozarks, leaving only a resilient few behind and forever changing the racial composition of the region. Kimberly Harper lives in the Missouri Ozarks.